When you’re ready for jewelry that makes an exceptionally big statement, check out Iradj Moini’s boutique in Soho. You may have already seen his work in the high fashion magazines, but these homemade pieces truly how the best when you try them on — that’s after your surprise that a designer had the imagination, skill and guts to pull this amazing work off. 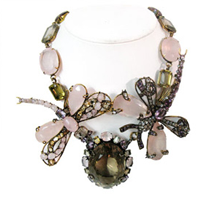 Using a mix of colorful stones, metals, and sizes, Moini’s jewelry has been exhibited at the Metropolitan Museum of Art as part of Iris Apfel’s collection and was also featured at the Lourvre, where he has three pieces in their permanent collection. While not inexpensive, this is jewelry that defies category or time and is, from snoety’s perspective, well-priced for the purchase.